Discussion in 'Windows' started by pradeep, Mar 15, 2007. A calendar on the desktop is a handy feature. My option to date has been to settle for Webshots, which is a nifty screensaver rotator utility and all that, but a bit bulky. Even when I turned off its screensaver functionality, its startup utility took up more time than I’m comfortable with. Enter Rainlendar, the cute windows desktop calendar! Tricky names aside, this is simply a fabulous find. It’s small, cute, has a negligible memory footprint, and looks great with its avant garde font. 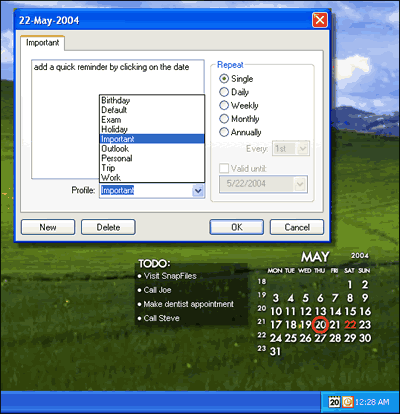 Best feature: It integrates right into my Microsoft Outlook through a MAPI interface — Calendars&Tasks. It even recognized my Archive.pst and pulled the calendar entries from there! No need to have a separate to-do list.